“THE JUDGE” (2014) MADE A GREAT IMPRESSION. There is one cool television show I watch. It’s called “Suits”. Two lawyer hotshots are in there and they are something like “Dr. House” in the world of law. If you ever wondered how Robert Downey Jr. would look in “Suits” here is your chance. “The Judge” is a film about a dysfunctional family in which father is the judge and son is a hotshot lawyer. Its atmosphere and family relationships reminded me on “August Osage County”. There, we had daughter/mother interaction, here we have a father / son relationship. Small, rural town in the US; family secrets and differences running so deep that when they come out: nothing will be as it was. Associations and connections between two movies were established, and during the film were even more profound. “The Judge”, for me at least, was a good mixture of hotshot law with family drama. Great acting performances, wonderful storytelling and satisfying direction were also some of the characteristics of this emotionally tense and appreciative film. Robert Duvall and RDJ gave great performances as father and son, and their dynamic moved the film all the way. Duvall is an Oscar nominee for supporting Role but I think that Simmons will dominate that category. With or without the Award, Duvall was wonderful. Bitter old man in which fire still burns and the wrongdoings of the past are haunting him is portrayed with high-class acting style that today seems all but forgotten. There were a few scenes in which Duvall was so good that I was truly moved (forgot all about family drama in the background) and I focused my attention only on him. First, in the toilet. In which powerful judge was so dependent on his (under-appreciated) son. Second on the witness stand where his moral code as a judge was stronger than worries for his legacy. 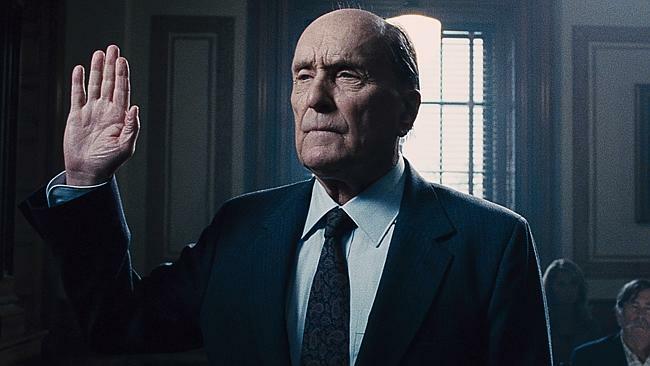 “The Judge” is the second film I’ve seen this week in which legacy had an important storytelling, role (second one – “Selma”). Conflict of generations in this movie is also a conflict of ambitions and legacy. Old man, sensing his departure, is worried about what he’ll leave behind and young one, crushing his obstacles, how to prove himself to his father that he’s finally a made-man. “The Judge” is not primarily a law drama in the end. It’s a heart-breaking story about respect and the power of love. Connection between father and son is not easily broken but even if it is broken, there is still hope for repair. I was deeply and emotionally involved in “The Judge”. Elements of warm and loving family story were inter-cut with elements of court drama. Yes, there were some which seemed extremely pathetic, but they had clearly defined role within the story. “The Judge” is definitely movie to see if you need something to lift your spirits up.